486 people in our community are currently praying with you. We decided to have a “Virtual Church” version of this hymn rather than a slick professional video. I got a big kick out of this - it's just like most churches: the guy with his hands in his pockets, the lady correcting her little boy, the latecomers looking for a seat, some young man who looks like he is in a coma, to the very end where you can hear the inevitable older lady with the loud warbly voice. 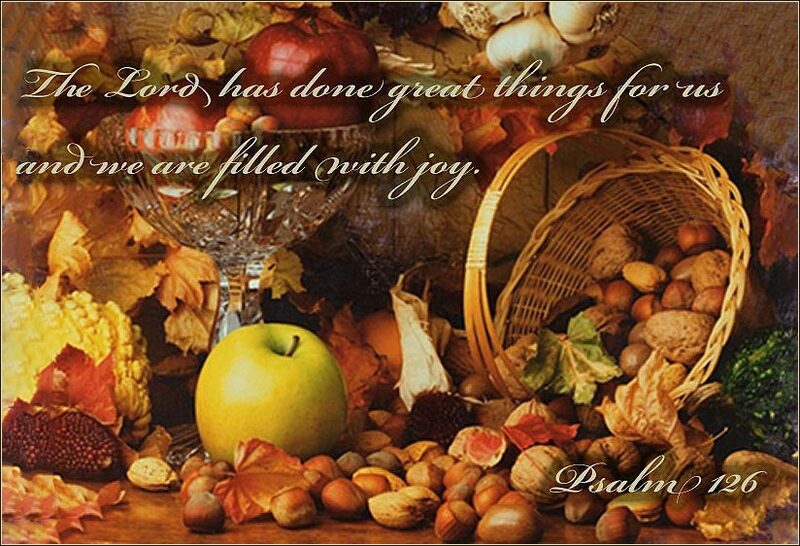 Almighty and gracious Father, I give you thanks for the fruits of the earth in their season and for the labors of those who harvest them. Make me and all of my brothers and sisters in Christ, I pray, faithful stewards of your great bounty, for the provision of our necessities and the relief of all who are in need, to the glory of your Name; through Jesus Christ our Lord, who lives and reigns with you and the Holy Spirit, one God, now and for ever. Simple Gifts is Shaker song was writtern by a Maine farmer, Joseph Brackett, in 1848. Grateful thanks we render now. Observe the commandments of the Lord your God, walking in his ways and revering him. For the Lord is bringing you into a good land — a land with streams and pools of water, with springs flowing in the valleys and hills; a land with wheat and barley, vines and fig trees, pomegranates, olive oil and honey; a land where bread will not be scarce and you will lack nothing; a land where the rocks are iron and you can dig copper out of the hills. Most Christians learn, over the course of their study and prayer, that giving sincere thanks to God alleviates much of the misery and depression they feel. Our base instinct is to complain. We look forward: what we have, we take for granted; what we lack, we bewail. But our Spirit is just the opposite. We know that all good things we enjoy have come from God, for without Him, we have nothing, neither life nor breath. 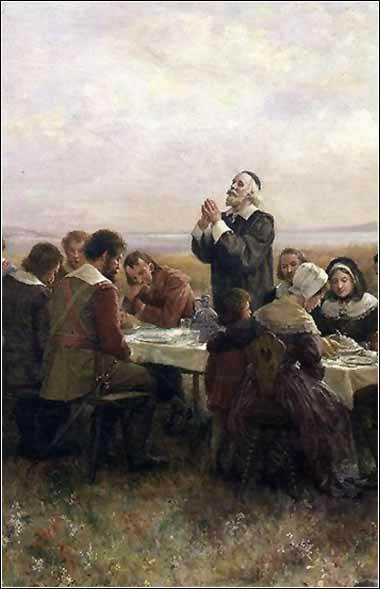 Another curative for self-pity is to consider those less fortunate; and at Thanksgiving Day, it is proper to remember the actual conditions in which the Pilgrims lived. They had landed in the middle of the New England winter. It isn't necessary to describe, in gory detail, the privation they endured. The statistics tell it all: By the time spring came, only 47 of the original 102 colonists were alive. And of those alive, only seven were strong enough to function, and had to take care of the rest. "And although it be not always so plentiful as it was at this time with us, yet by the goodness of God, we are so far from want that we often wish you partakers of our plenty." Detail from The First Thanksgiving by Brownscombe, c. 1914.